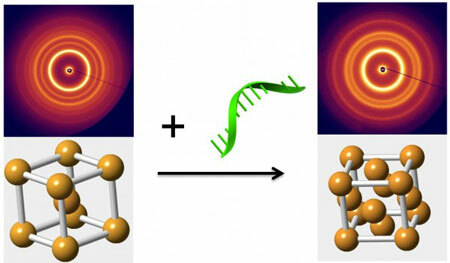 (Nanowerk News) Scientists at the U.S. Department of Energy's Brookhaven National Laboratory have just taken a big step toward the goal of engineering dynamic nanomaterials whose structure and associated properties can be switched on demand. 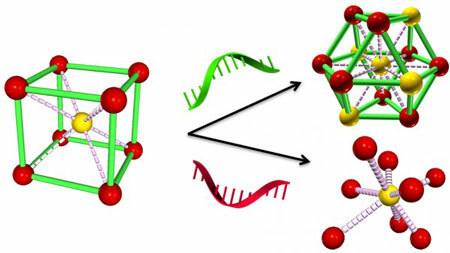 In a paper appearing in Nature Materials ("Selective transformations between nanoparticle superlattices via the reprogramming of DNA-mediated interactions"), they describe a way to selectively rearrange the nanoparticles in three-dimensional arrays to produce different configurations, or phases, from the same nano-components. "One of the goals in nanoparticle self-assembly has been to create structures by design," said Oleg Gang, who led the work at Brookhaven's Center for Functional Nanomaterials, a DOE Office of Science User Facility. "Until now, most of the structures we've built have been static. Now we are trying to achieve an even more ambitious goal: making materials that can transform so we can take advantage of properties that emerge with the particles' rearrangements."